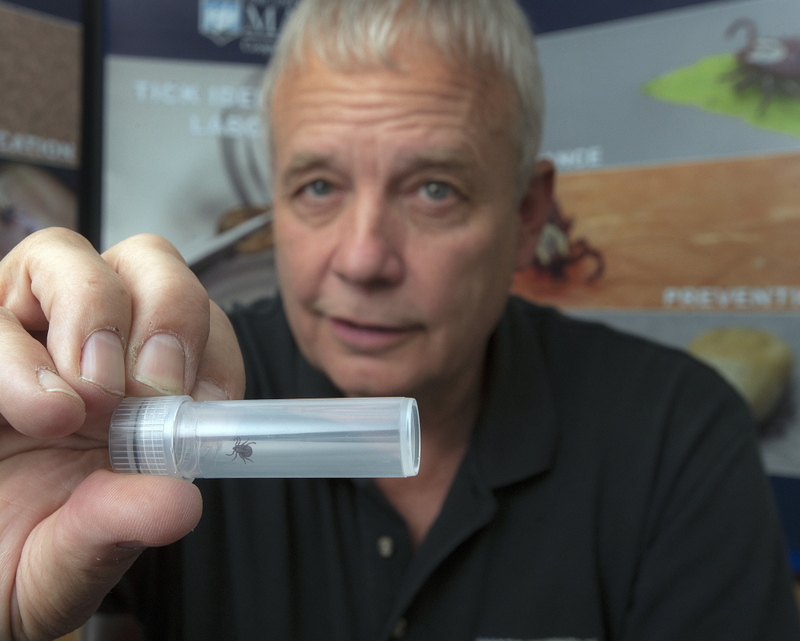 The pest management specialist based in Orono has an ominously busy spring identifying ticks. Jim Dill is a pest management specialist with the University of Maine Cooperative Extension. He has also served in the Legislature since 2010, including as the chair of the Agriculture, Conservation and Forestry Committee. On Tuesday, he won the primary to be a Democratic candidate for the state Senate. Dill is the man you go to when you want to talk about ticks. And other insects; we caught him as he was just returning to the UMaine Extension tick ID lab in Orono after dealing with a fly problem at the Department of Agriculture (possibly manure-related). YES, HE HAS MORE TO WORRY ABOUT THAN EVER: “I didn’t know what a tick was, growing up in southern Maine,” Dill said. Now they’re everywhere. Climate change “probably has something to do with it,” he said. In an average year, about 100 people come into the lab asking for tick identification. “We are already at 70 this year, and people haven’t been out and about because it has been so wet and nasty,” he said. WHAT TO EXPECT WHEN YOU DEVELOP A TICK EXPERTISE: Many ticks, delivered to your door, or rather, the Cooperative Extension laboratory. “One guy just dropped off about 150 ticks preserved in Bombay gin of all things,” Dill said. “I asked him, ‘Is this like the tequila worm?’ ” The gentleman, who picked them off his dog, told him he’d decided he didn’t care for Bombay, and “this was as good a use as any for it.” The lab preserves all specimens for a year in case the person who left them gets sick later and wants the tick for testing. THE OTHER 0.1 PERCENT OF THE TICKS, WHAT ARE THEY? “There are 14 species of ticks in the state of Maine,” Dill said. The winter ticks are making the state’s moose miserable because they don’t drop off after feeding, staying on all winter. (According to estimates, 30 percent of the Maine moose herd may have perished this year, many possibly dying from exposure after rubbing off their fur on trees in an attempt to shed ticks.) Others include the rabbit, squirrel or woodchuck ticks. The woodchuck tick carries the rare and powerful Powassan virus, which last year killed Rockland artist Lyn Snow. ANYTHING ELSE WE CAN DO? (CAN YOU TELL WE’RE DESPERATE?) Cut back plantings around the foundation of your home. “Heavy foliage actually harbors deer ticks quite nicely,” Dill said. THE CREEPIEST TICK STORY OF THE MONTH: “Two weeks ago, we had a guy bring in a partially engorged deer tick he’d found on his seven-day old baby,” Dill said. “It was right behind his ear.” Once he knew for sure what he was dealing with, the Bangor- area dad took the tick away to be tested for Lyme.